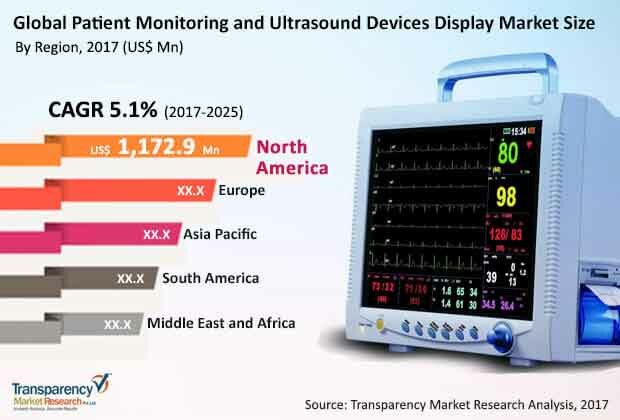 The presence of a large number of players renders high fragmentation in the global patient monitoring and ultrasound devices display market, says Transparency Market Research (TMR) in a new report. However, this does not ceases competition in the market, wherein leading players are focused on providing cost competitive products to customers. These players are engaging in strategic partnerships and mergers and acquisitions to attain such business objectives. Key players operating in the global patient monitoring and ultrasound devices market include Philips Healthcare, Toshiba Medical Systems Corporation, Hitachi Medical Corporation, Esaote SpA, Beijing Jing Jing Medical Equipment Co. Ltd., Shanghai Fosun Long March Medical Science Co. Ltd., China Medical Equipment Co. Ltd., Beijing Leadman Biochemistry Ltd., Shimadzu Corporation, Carestream Health, Barco NV, Hologic Inc., EZISURG MEDICAL, Cook Medical, Medtronic Inc., Lifetech Scientific Corporation, and Shanghai United Imaging Healthcare Co. Ltd. The demand for patient monitoring and ultrasound devices display market is likely to rise at a moderate rate to say the least. TMR’s report prophesizes the market to reach a valuation of US$4,605.4 mn by the end of 2025 registering a 5.1% CAGR for the forecast period from 2017 to 2025. In terms of device type, patient monitoring device type and ultrasound device type are the segments into which this market is divided. On a geographical footing, North America held the leading market share in patient monitoring and ultrasound devices display market in 2016. Globally, the healthcare industry is witnessing a radical shift from conventional tools and practices. The emergence of digital imaging and diagnostic technology and evolution of old traditional monitors into digital multi-function monitors that can track an array of vitals at one time provides advantages of miniaturization and portability. These monitors are employed for diversified functions in hospitals, clinics, and diagnostic labs among others. This is acting as a key factor behind the growth of patient monitoring and ultrasound devices display market. The rising adoption of hi-tech devices such as cardiac monitors, multiparameter monitors, and others have led to the tremendous growth of patient monitoring and ultrasound devices display market over the past couple of years. Apart from this, demand for advanced diagnostic technology that enables high contrast and best resolution imaging is anticipated to boost the patient monitoring and ultrasound devices display market globally. Advanced patient monitoring and ultrasound devices that are technology-driven need to be meticulously designed to serve imaging and diagnostic functions. This leads to high cost in the manufacture of these devices. Lack of trained personnel to operate patient monitoring and ultrasound devices display could also hold back the market’s growth to some extent.